I don't believe people when they say they don't have a sweet tooth. There is always a little bit in everyone that wants to have a lil treat every once and while. Or maybe this is what I tell myself to feel better but anyways just around Valentine's Day I felt in the mood to make a little treat for my friends. 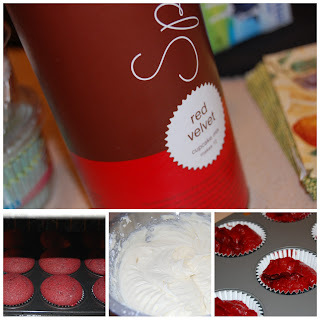 While I love to bake from scratch I took a different route this time with Sprinkles cupcakes mix. You must admit that Sprinkles cupcake mix is quite the upgrade from Betty Crocker. You all have to have known the press built up about these famous cupcakes and personally I don't think I'm ever dissappointed when I try a new one but its hard to try new when you're addicted to a classic. Red Velvet Cupcakes. The first time I think I heard the term red velvet when I was young was possibly when my mom told me it was my dad's favorite kind of cake. It didn't sound good to me at the time, who wants to eat red cake? But once I heard there was cocoa involved, I was hooked. The sprinkles cupcakes can go for about $3 a cupcake. Can you imagine buying all those for a dinner party of just 5? $15 spent so everyone can just have one cupcake, not fair. When I stumbled upon this mix and Williams-Sonoma I had to try it. It was very simple, beat butter, add mix, add eggs, add milk, done. Could it get any easier? But what is a cupcake without frosting? This is the part I stress to you, don't get lazy, make the icing from scratch! I hope I didn't lose the new bakers right now who were with me on the mix and now just bolted, this is just as easy. Cream cheese frosting does it all, its the icing on the cake (pun intended)! Cupcakes are loved by all, they're nostalgic and extrememely hard to resist. Bake them for your next dinner party or bring them into work (my plan) and they'll be a hit (true story). And the best part is, with the mix your dinner party of 5 can have 12 cupcakes for $14. I'd tell you to do the math but you'll be too busy licking your fingers!